Increase Revenue & Consumer Confidence! Today car dealers give up traditional pen and paper vehicle inspections for their inconsistency, incompleteness and lack of accuracy. Modern dealerships gradually switch to automatic and highly developed technologies which provide instant, exact and user friendly results for further application and implementation. Our Vehicle Inspection Report™ software gives a new breath to the old car inspection process providing a real-time data stream, storage, reports and data distribution capabilities. 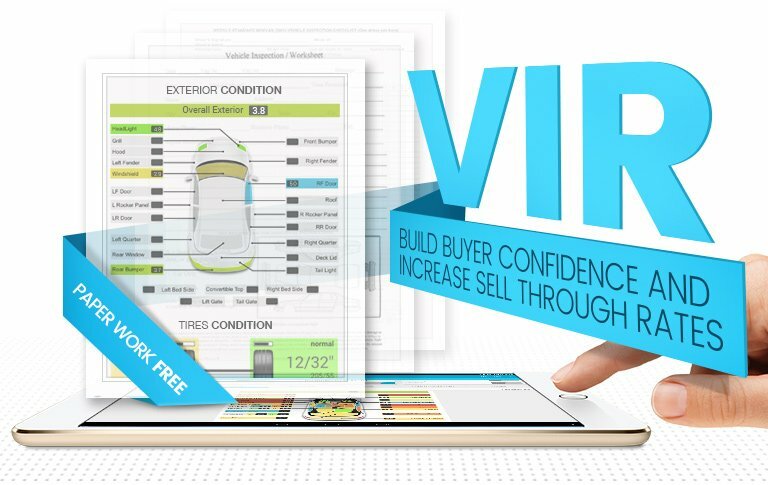 VIR™ fully satisfies auction needs and demands which makes it competitive and winning on today’s car dealer market. 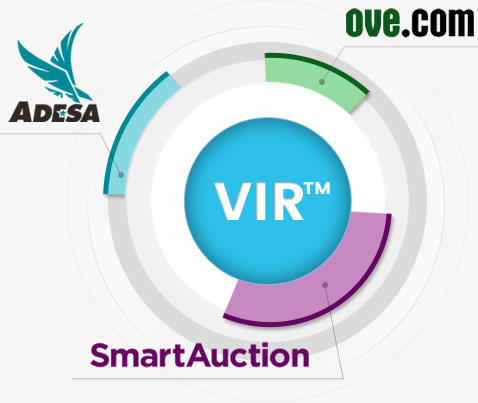 VIR™ is a good match and partner to such well-established and the most popular auctions as OVE, Adesa and SmartAuction. Car dealers don’t need to fill out the forms any more to publish their inventory data. VIR™ tool is able to send data feed to the auction websites automatically. 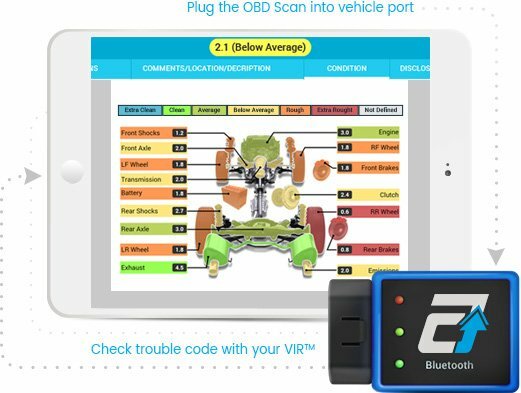 Build consumer confidence by providing highly accurate and detailed information about the true condition of the vehicle. Reduce post sale complaints and arbitration claims. Remarket the vehicles on the most popular auctions like OVE, Adesa and SmartAuction. Increase sales as a direct result of providing the transparency dealers need to make informed decisions. Generate additional revenues by offering on and offsite Vehicle Inspections. 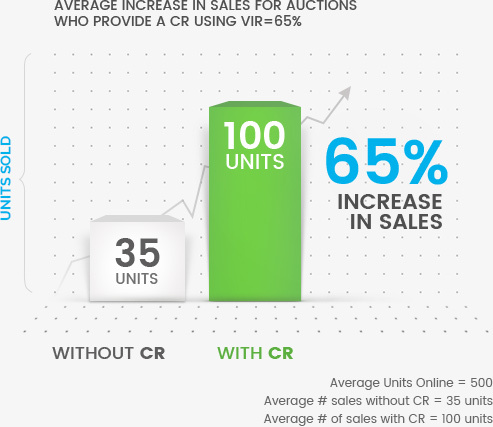 * Please note all numbers are based on real live auction data from our clients who utilize the VIR to remarket their dealers inventory. Choose category (as is, as described, front line ready, NIADA certified program or OEM-CPO eligible)*. Weighed vehicle grading system increases dealer confidence (similar to Manheim). Admin dashboard that allows users the ability to manage all inventory. User access controls limits puts you control of who can view, update and assign a VIR™. Choose physical location of vehicle. On the fly or bulk image upload capability. Ability to attach photos to specific damaged areas. Enter vehicle details and recovery information. Enter pricing information (starting bid, floor price, bid increment, buy now price). VIN decode scanner either via 2d or 3d barcode scanner**. Manually add or edit vehicle options. * The level of detail our VIR™ provides is not available with any other system on the market today. ** Our software is designed to work on a number of different platforms and devices some of which utilize built in 2d or 3d barcode scanners or externally connected via Bluetooth.